The U.S. Department of Education gives each State the right to determine what constitutes adequate yearly progress (AYP) based on that State’s final assessment system. Instruction must be rigorous enough to demonstrate “continuous and substantial” yearly progress. 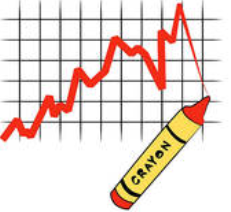 High-stakes standardized testing is one measure of school achievement and competency. At the least, the results of this testing can determine whether accommodations have been successful, and services have been effective in preventing a widening achievement gap. At most, results can determine whether a student is promoted to the next grade or graduates. Though high-stakes testing is one measure of academic achievement, it cannot be the only source of data used to determine whether a student has made substantial gains toward AYP. With the weight of these considerations at stake, it is no wonder parents, students, and teachers may feel pressured by the impact of these tests. The number of students who are deaf and hard of hearing (DHH) served in the general education setting continues to grow. However, these students still lag behind their hearing peers, specifically in language and reading, secondary to the impact of hearing loss. This has made the need for appropriate supports and services by personnel with highly specialized skills and knowledge a critical factor for success. Under IDEA, states must use information about the performance of children with disabilities in state and district-wide assessment programs to revise their State Improvement Plans, as needed, to improve their performance. Educators cannot wait until the end of year to determine if teaching practices, accommodations, and services have been effective. Progress monitoring is critical. Results of high-stakes testing may underestimate a student’s actual skill and abilities. Students who are DHH, especially those included in a general education setting, are often at a disadvantage during high-stakes testing due to their limited knowledge of the language style and structure of the tests. Tests use phrasing, grammar, and syntax that differs from everyday English, often including idioms, multiple meaning words, and complex grammar that is unnecessary to comprehension of text. For a student with an interpreter, the interpreter may account for the student’s language ability and modify communication to assist comprehension. If familiar presentation of the language is not used during high-stakes testing, the consequence is an unfair disadvantage when the testing is presented in written form. For students who use sign language to communicate, some schools allow only a verbatim interpretation of the test. For a student who receives the accommodation of signed translation for test items and/or questions, the ASL interpreter must now change the communication system to present the test items as they are written. Students who are DHH being educated in the general education setting are typically the only student in that classroom with hearing loss. The student’s teacher is likely to be unfamiliar with the effects that hearing loss can have on equity of test results in comparison to typically hearing peers. Is RTI the Same as Progress Monitoring? 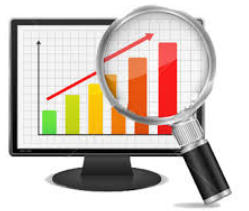 Progress monitoring includes forming a baseline for present levels of performance and completing weekly or monthly assessments with a number of tools to verify small incremental gains in student progress. Response to Intervention (RTI) techniques are often used to monitor progress of students who are DHH included in the general education classroom. RTI was originally intended to identify hearing students who have learning disabilities. This type of monitoring includes selection and implementation of “evidence-based tools, with consideration for cultural and linguistic responsiveness and recognition of student strengths.” According to the National Center on Response to Intervention, RTI is a framework for providing comprehensive support to students. It is not an instructional practice. RTI is a prevention-oriented approach linking assessment and instruction that can inform educators’ decisions about how best to teach their students. A goal of RTI is to minimize the risk for long-term negative learning outcomes by responding quickly and efficiently to documented learning or behavioral problems and ensuring appropriate identification of students with disabilities.” Though this type of formative assessment is used by districts, it is not intensive enough, tailored to DHH unique needs, nor can it be applied appropriately, as our students have education issues secondary to access barriers and not learning disorders. Collecting accurate and valid data on students who are deaf or hard of hearing is an ongoing challenge. 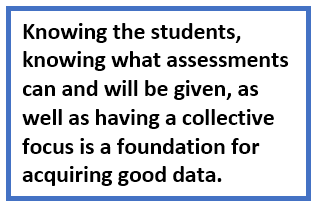 Educators in the field have struggled with finding, modifying, and “reinventing the wheel” when it comes to assessments that can provide parents, school teams, and administrators with valid information reflecting present levels of performance. Part of the difficulty for educators is that there is no one progress monitoring tool or assessment that is appropriate for all students with hearing loss. Student’s variability in type and degree of hearing loss, age of onset, language exposure, and modes of communication are a few of the variables that can complicate the process of choosing the correct monitoring instrument. In addition, assessment for students with hearing loss is largely misunderstood and assumed to be covered by the typical tests and data collection used with students who have common disability conditions. The type of assessment that is needed is often overlooked in favor of the type of assessment that schools require. 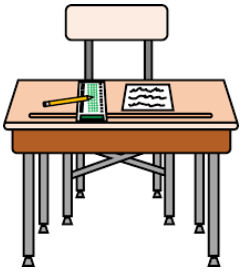 Many educators of the deaf and hard of hearing providing itinerant services, are forced to rely on the general education teacher, who is unfamiliar with the unique needs of a student with hearing loss, to collect informal data on a daily or weekly basis. To intervene with school teams appropriately, educators of the DHH must be attentive to the curriculum being presented to our students in order to plan, accommodate, modify and collaborate to provide tailored instruction prior to valid progress data collection. It is also essential that educators of DHH have a working knowledge of the progress monitoring tools used to assess students’ skills. Students in early elementary grades are often given formative assessments that test their ability to use phonological knowledge and apply it to the written word. Due to auditory access issues, phonological awareness is frequently delayed. Students who cannot access sound and whose teachers and interpreters are unfamiliar with Visual Phonics as a strategy may make little progress. Even if they are familiar, this strategy may not be implemented intensely or consistently enough to result in true progress. In this case, training may need to be offered to the educational team, a more appropriate monitoring instrument may need to be used. For some students, progress monitoring may need to be overseen by the Teacher of the Deaf. Equally, students who use ASL may not be assessed appropriately with data gathering that includes the phonological aspects of ASL. Concurrently, many schools use computer-based progress monitoring which depends upon auditory skills to access the information. This may not be appropriate for students who have delays in auditory skill development or minimal auditory access as well as those who use ASL or other manual communication systems. Measuring these skills equitably may (again) require alternate presentation methods such as the use of Visual Phonics. For a student who uses ASL, Gallaudet University has developed ASL Assessment Toolkits that measure ASL phonological awareness and receptive skills (insert link here). Are Standardized Test Scores Enough as a Measure of Achievement? No, high-stakes test results are an insufficient measure of achievement. Without additional data, standardized testing results have limited meaning, and provide little insight for planning instruction. When preparing for end of the year meetings with other teachers, parents, and professionals, it is essential to use data from additional sources as well as the data retrieved from high-stakes testing. IDEA mandates that other sources as well as high-stakes testing be considered when evaluating yearly student progress. What Additional Data Should be Gathered? 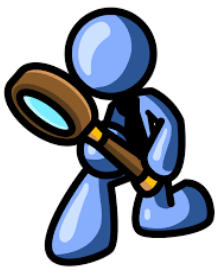 Observation data – this can be qualitative as well as quantitative. Teacher reports that include present levels of functional, behavioral, developmental, and academic performance. Language samples – spoken and/or signed, and written communication. This can be done with a voice recorder, video, and by collecting samples of written language throughout the year. Student interviews (when appropriate) – how does the student feel about his/her educational experience? Daily records of hearing technology use. With the amount of collaboration necessary among a child’s educational team, collecting data on students who are DHH is no small task. Teachers who provide services via the itinerant model and classroom teachers of the deaf and hard of hearing rarely have the time in their schedules required to do all that is needed to support good student outcomes (e.g., teach to the unique needs of students, consult enough with the school staff to accommodate or modify to meet student needs, and gather relevant and valid progress monitoring data). Therefore, relationships with school staff are a critical component of this data gathering process. It is often the responsibility of the teacher of the deaf/hard of hearing to establish relationships with campus administrators, general education teachers, and other service providers to effectively collaboration in data gathering. The challenges presented touch only the surface of the issues with high-stakes testing and continuous monitoring of our students who are DHH. As long as high-stakes test results continue to be used as a primary gauge of adequate yearly progress, educators must be cognizant of the demands it places on students with hearing loss. It is critical to ensure that the progress monitoring tools being used are the most valid (appropriately matched) and accurate measure of student skill. Test equity for individuals who are deaf or hard of hearing. (2008). PePNet Test Equity Summit. Retrieved from http://resources.pepnet.org/files/356_2010_2_1_16_35_PM.pdf. ; Cawton, S., & Leppo, R. (2013). Assessment accommodations on tests of academic achievement for students who are deaf or hard of hearing: A qualitative meta-analysis of the research literature. American Annals of the Deaf, 158(3), 363-376. PePNet Test Equity Summit Highlights. (2008). About the Author: Brenda Wellen has been a teacher of the deaf/hard of hearing in center-based and itinerant settings for 28 years. She recently completed a graduate degree in Deaf Education and Reading Specialist certification.